While lofty, long-term goals are inarguably key to an organization's strategic direction, setting incremental goals and celebrating small wins are essential employee engagement activities. Whether you aim to increase revenue by $10 million, launch a new product within a year, or improve safety ratings to 98%, you can engage and inspire your team by celebrating continuous progress toward these big goals. Research has shown employees' engagement and motivation levels skyrocket when they have achieved progress toward goals. Harvard Business Review conducted a study with the goal of determining how emotion and mood relate to creative output and productivity. Through daily surveys to project team members, HBR found that people's creativity and productivity levels were greatly improved on days that they reported happiness and good moods. 76% of reported best-mood days were days in which progress was made. On these positive days, their perceptions of colleagues and the organization itself were also enhanced. 67% of participants reported set-backs toward goals on days in which their moods were the worst. Small wins are crucial to maintaining emotional health, both in business and in our personal lives. Humans are hardwired to crave progress, with the desire to "be on a winning team." Despite evidence that recognizing and celebrating progress greatly improves team's morale and productivity levels, fewer than one half of managers do so. 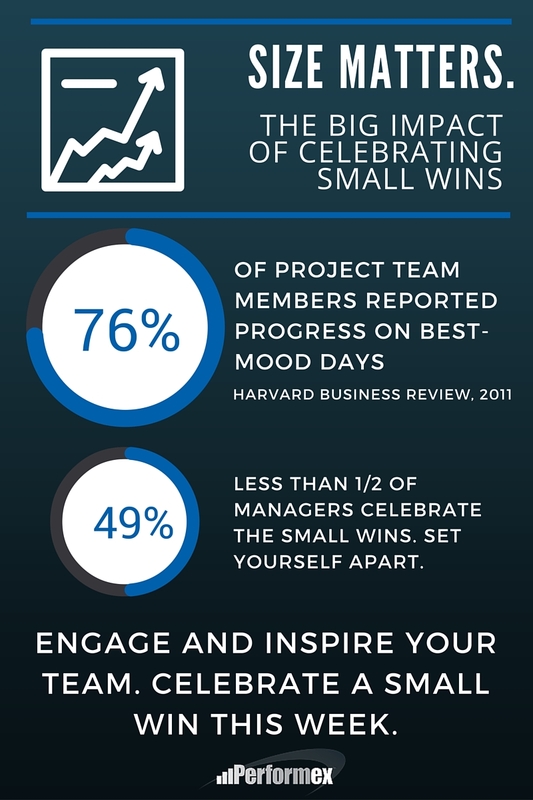 Boost your team's engagement and motivation by setting time aside for celebrating small wins. Whether you throw a pizza party, recognize an employee who went above and beyond, or create a celebration ritual unique to your team, the time and money that you invest in celebrating small wins will pay off in a big way. Check out additional strategies for developing inspirational leadership skills.